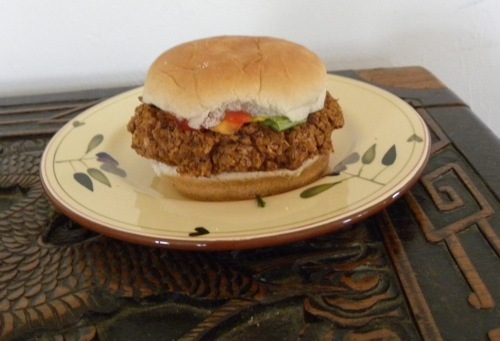 I came up with this recipe yesterday while trying to think of a new veggie burger that I could make quickly for lunch. We really liked the results, so I thought I'd share them here. Drain almost all liquid from beans. Puree in a food processor. Put in a bowl and mix with seasonings and bread crumbs (add extra bread crumbs if paste is still too runny to make patties). Make patties. Add cheese if you'd like to make it a cheese burger. Bake at 350 for 15 minutes (you might want to experiment with this because I'm not really trusting my oven's temperature these days because it's been rather inconsistent lately). Serve on a bun (I added ketchup, mustard and green onions). You could serve it as a taco burger too. With Salsa and sour cream instead of ketchup and mustard if you wanted to change it up. I may try this! I have a favorite veggie burger in my house, but this one is quicker. I'll have to keep it in mind for when I need something faster! Oh my gosh... if only I wasn't in college without the equipment to make this! Looks super!